During the warmer months, we often fire up the grill and cook outdoors. 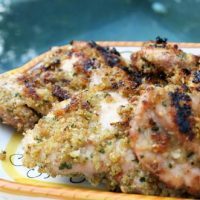 This is an easy recipes using skinless, boneless chicken thighs which are delicious and moist inside with a crisp, spicy outer coating. It really does pay to make your own breadcrumbs as the texture and flavor is far superior to any store bought brands. Simply cut day old bread into chunks and blend in your food processor until you achieve the desired consistency. I like my fresh breadcrumbs a little coarser than the processed store types. I am not a huge fan of anchovies, so often use anchovy paste instead of the entire anchovy which I find to be milder. You really do not taste the anchovy in the coating, and it simply adds a depth of flavor that is delicious. Indirect cooking is a method by where you heat up one side of the grill to high, and place your food on the other side, cooking the food with the grill lid closed. This method is one we often use for cooking chicken to keep it moist, and we usually simply grill the chicken directly for a few minutes at the end to obtain a crisp brown color. Marinating the chicken thighs helps keep them tender and moist. Rub the chicken thighs with the 3 tablespoons of olive oil. Place the remaining ingredients in a food processor and pulse until you get a coarsely blended consistency. Press some of the coating onto both sides of each chicken thigh, and refrigerate for at least 1 hour or up to 4 hours. Preheat the grill and prepare for indirect cooking. Cook the chicken for 15 minutes on each side, then reduce the heat to medium and place the chicken thighs directly on the hot grill to brown each side. 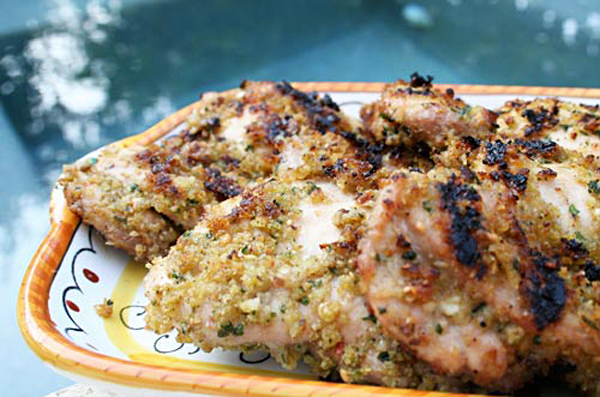 Place the thighs on a platter, and serve with lemon wedges.